Like many other people in the Tri-State area my family has had a tough week with Hurricane Sandy. We are thankful that we are all healthy and that we did not have any significant damage from the storm. Recently we got our power back and were able to return to our home and just in time for the most recent snow storm. There are many people who are displaced or living in the cold without power. And there are some who have sustained serious damages to their homes. In the moment it was hard to reflect on the experience. This past Shabbat I went to California and got out of the grips of Sandy. While I hated leaving my family I had to go for work. I participated in a wonderful Shabbaton with a group of Assistant Camp directors. During my trip back I had the pleasure of trading stories about our children with Aaron Cantor the Associate Director for Camp Seneca Lake. There is one sweet story that he shared with me that helped me process part of my experience of Sandy. But what is the value of having this ever-burning light? Lily’s story taught me a great lesson. Lily has an amazing sense of empathy. The Torah needed a night-light, because we all need a night-light. We are all afraid of the dark and not just little kids. 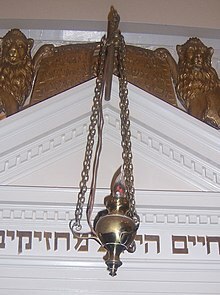 The idea is that the community should always have a night-light whether in the Tabernacle of a synagogue. Sandy has taught me a number of things. Sandy reminded me the value of having friends and a community. We need to invest in those relationships in the good times so that they are in place for the hard times. We need to support community institutions with our time, talent, wisdom, and money. I am also reminded that despite the advancement of technology in our civilization, we still live and die at the whim of nature. Control is just an illusion. And Lily’s story taught be that being in the dark, whether without power, information, friends, or community, is just plain scary. So yes, we all need a night-light. In many respects, empathy is the light of the Torah itself.